Clarksville, TN – Major league baseball scouts use the old saying ‘Shake a tree full of 10 prospects and nine gloves and one bat will fall out’. Well, the same thing could be said of fast pitch softball players too and that helps adds to just how impressive Danielle Liermann, Kacy Acree, Carly Mattson and Kendall Vedder’s first two seasons have been for the Austin Peay softball team. On April 26th, Liermann became just the second player in Austin Peay softball’s 32-year history to reach 100 career hits – no matter what grade classification – in their first two seasons, joining Louranda Sanders who played from 1998-2001. In fact, both reached the 100-hit mark in under 90 total games played, meaning both averaged over 1.1 hits per game in their first two seasons. But it’s not just base hits Liermann gets, its extra-base hits, with 21 doubles, a triple and 16 home runs among her current 102 career hits. And while she’s wrapping up her second season in the red and white this coming weekend, her totals all-ready rank high all-time in school history, with her hit total tie for 31st most, doubles tie for 16th and home runs tie for seventh most. Liermann also already ranks 11th in career runs batted in (70), third in slugging percentage (.577) and batting average sixth (.340). 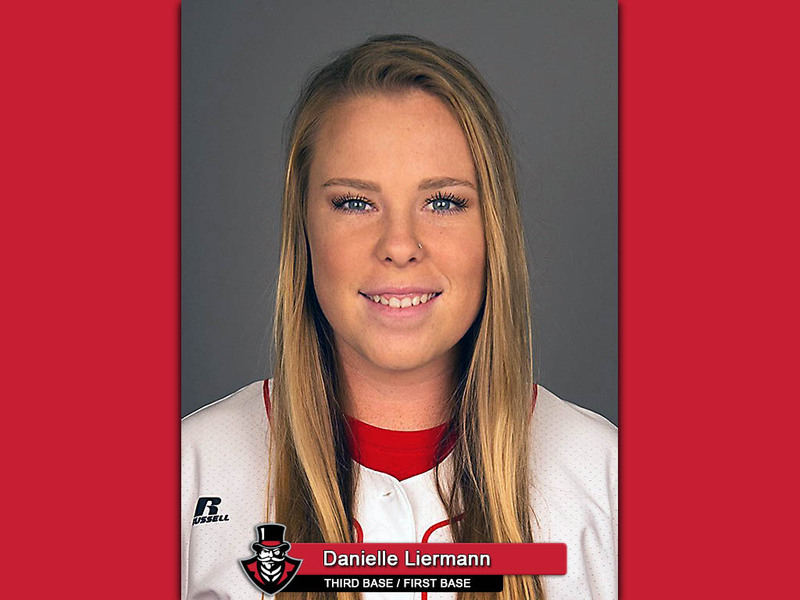 If Liermann has been the Govs number-one offensive option the past two seasons, when Acree’s offensive threat is version 1.1, with a career batting average of .314, with 87 hits – including 19 doubles, six triples and 13 home runs – while scoring 61 runs, driving in 47 and stealing 18 bases. Acree’s home run and slugging percentage already ranks in the school’s top-10 all-time, while her triple and batting average are just outside the school’s top-10. After a solid freshman season, Mattson may be the most improved of the four sophomores in her offense attack this season – despite having to carry the load of catching 41 of the Govs 46 games — seeing her batting average jump over 50 points from last year and improving to a .274 career mark over her first two seasons and already moving into the school’s top-10 in home runs, with 14. Mattson also has a very good eye at the plate, leading this year’s squad with 19 walks. Finally, Vedder, who plays shortstop, has seen her batting average improve 23 points from last year, but more importantly has seen her extra-base totals go up – including seeing six balls leave the park this year – which in turn as help see both her runs scored total and runs batting in total both almost double from her solid freshman season. While the four have had impressive first two seasons for Austin Peay, the best thing is they still have two years to go in their careers and futures that should cement the quartet as one of, if not, the best foursome’s in APSU softball history.